I don't know if you are like me, but whenever I am around town running errands with my husband and 2 kids, I am always looking out for cute restaurant spots and snapping pictures with my phone. Why? because when the time comes to plan for a date night, my hubby and I never remember that "cute restaurant" we saw when driving to grandma in Brooklyn...Now I decided to keep posting about the places we eat and share them with you. Hopefully, I will be a reference to you for when you are looking for good places to eat in the area. Check out my other FOOD POSTS. Meadowsweet NYC is the perfect location in my opinion, for a date night. First date, second date....40th date! The service is excellent. The food is to die for. 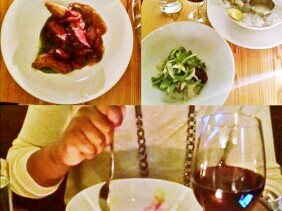 Located in Brooklyn NY, Meadowsweet gave me a Bistro/European vibe that I fell in love with. You must check out their website, reviews on Yelp and Zagat. I am planning to go back for their brunch and also try out their $65 - 5 Course tasting menu. Thanks for stopping by, love always, Martine.